In many applications, you would like to hold the speed of a motor constant, even as variations in the power supply voltage or mechanical load try to change its speed. In other applications, the average current to the motor needs to be limited, so the initial in-rush current when starting the motor is not too high. Also in some applications you would like to allow the motor to be in locked in a stall condition, without doing harm to the motor or the drive circuit. These two features can often be combined in a single control circuit. There are many ways you can monitor the speed of a DC motor. Some techniques connect some type of rotary sensor directly the motor shaft. This method can often lead to a very accurate speed measurement, since the sensor may produce multiple pulses per shaft rotation. There are countless optical and magnetic sensors available for this purpose. When possible, I like dispense with any external sensor and to tap into the signals produced by the motor itself, to gage the motor speed. Motors with a three phase brush commutator (three brush rings) will usually produce a very clean back emf signal. This is the voltage produced by the motor, if it was coasting at a specific speed, without any applied drive. Knowing the relationship between the back emf voltage and the shaft speed, you can design a circuit to maintain any constant motor speed by monitoring the back emf voltage. But, few motors use a three phase commutator. Most DC brush motors you will encounter will be single phase type. Often these DC motors will produce clean current pulses, each time the brush commutator changes the polarity of the DC applied to the motor windings. Using a small resistance in series with the motor drive circuit, you can extract these pulses to measure the motor speed. For many inexpensive motors, which are often used in toys and some consumer appliances, neither the back emf method nor the brush current pulse methods will work. The signals are just too noisy to be practical. With these motors, only an external shaft sensor will work. You will have to conduct some experiments on the particular motor you want to control, to determine the best speed monitoring method. 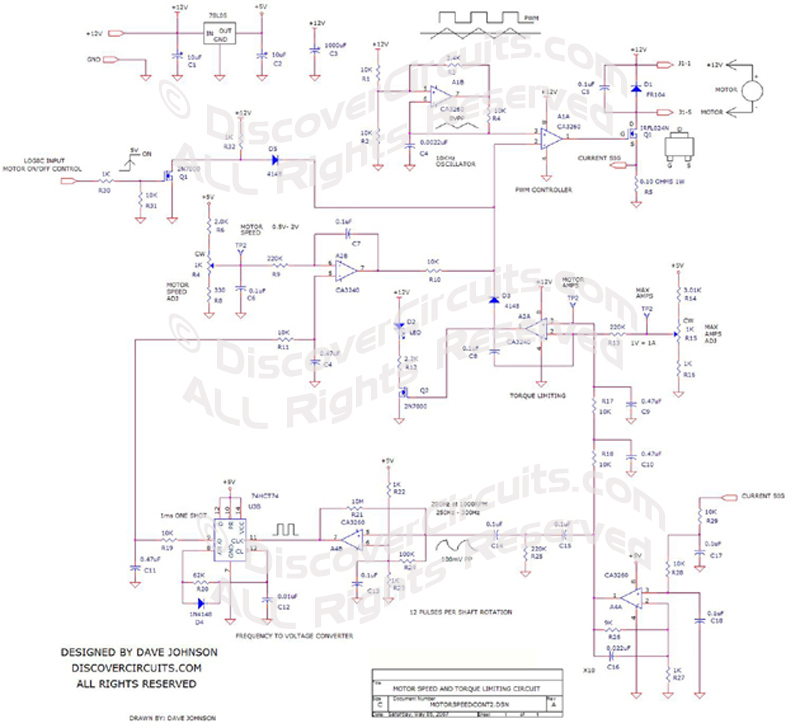 The circuit below is a speed control for a medium power 12v DC operated single phase brush motor. It uses the brush current pulse method to monitor the motor speed. It includes a method to limit the average motor current. I have also included a means to turn on and off the motor from a simple TTL logic signal. The circuit uses some rather old op Amp ICs I had laying around. Other op Amps and voltage comparators could also be used. The circuit uses a pulse width modulation (PWM) scheme to control both the motor speed and the maximum average current. The current control is handy when you want to limit the motor torque, since motor current and torque are directly related. The circuit uses the current pulses from the motor brushes to extract the motor speed. For the motor I used, there were exactly 12 pulses per shaft rotation. The typical average motor current was about 1.2 Amps with a speed of about 1000RPM. At 1000 RPM, the pulse frequency works out to be 200Hz. D-flip/flop IC. The output of the one shot is then filtered, to produce a voltage, proportional to the pulse frequency. An op Amp then compares the speed signal to an adjustable reference signal. The output of the speed error Amp, then is connected to the PWM circuit, to maintain a constant motor speed. In a second circuit, the average DC current is monitored using the DC voltage across the 0.1 ohm shunt resistor. It too has an adjustable reference, so the limiting current (torque) can be controlled. A diode isolates the two control circuits from the PWM circuit. A second diode routes +5v to the PWM control input, when the on/off input logic control signal is low. This pushes the PWM output signal low, keeping the motor turned off. A 5v voltage regulator is used to provide a stable +5v voltage to the speed and torque reference circuits.